Archive by category "ApnaComplex Review"
The new design boasts of bright colors and a contemporary user interface. The new design also makes the website mobile friendly. 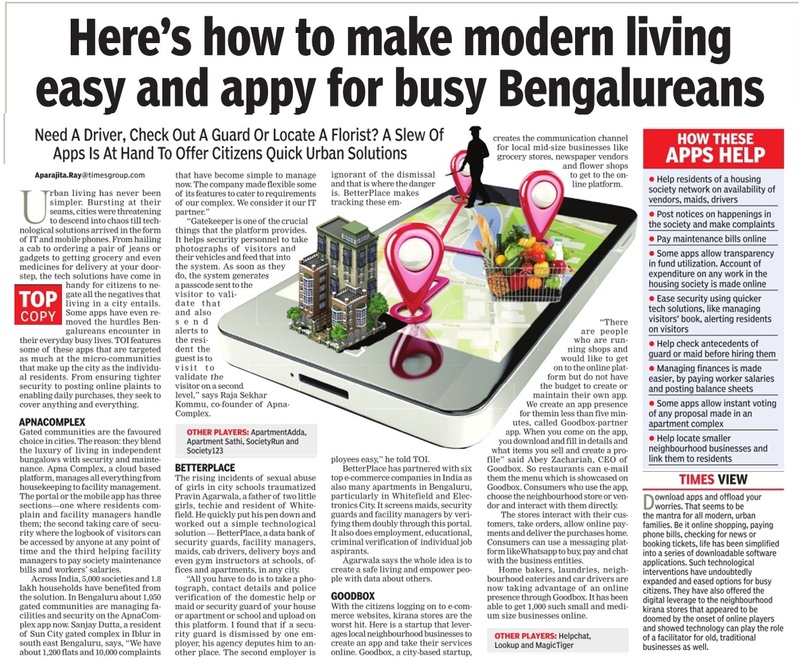 ApnaComplex is featured on Times of India today under the apps that are making a positive impact to urban living in cities like Bangalore. We are happy to see the recognition we have got. Click on the image below to read the entire story. We are happy to announce the availability of a new “consolidated” dashboard view for “Request Approver” role. As you know “Request Approver” role in ApnaComplex can approve several types of requests – including Request Box Requests, Purchase Requests and more recently Expenditure Bills. You had to go to each of individual menu items to be able to see the requests pending for your approval. It was confusing for most users to navigate to different menu items to be able to go to each type of approval. 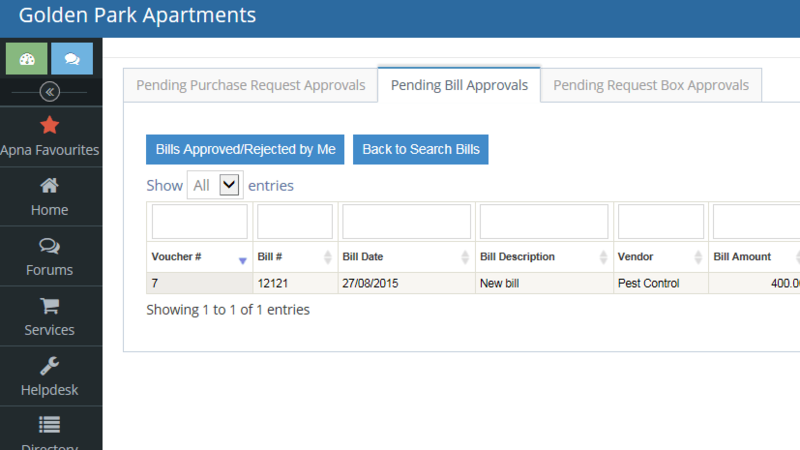 We have now consolidated screen for all requests pending approval for the “Request Approver” role. As soon as you switch to the role you can now notice a view with 3 tabs that lists requests pending for approval under Purchase Requests, Bills and Request Box Requests. Makes approving/rejecting requests super easy. In case you navigate away from the dashboard doing other activities in this role, all you need to do to click on Home->Dashboard to be able get back the consolidated view. Do note that this view is only visible for Request Approver roles. ApnaComplex was today covered in Saakshi News Paper – a telugu daily under the Startup Series. Click on the image below to access the press coverage (for our audience who can read telugu)! Motivates us to continue our journey! There is no better way for ApnaComplex team to celebrate the festive season than receiving a glowing testimonial from Major Ramesh Ramachandran, Joint Treasurer of Vasanth Vihar AWHO – a 424 unit residential complex in Bangalore. Vasanth Vihar AWHO has adopted ApnaComplex around May 2015 and has instantly experienced the benefits of the powerful accounting capabilities of ApnaComplex. 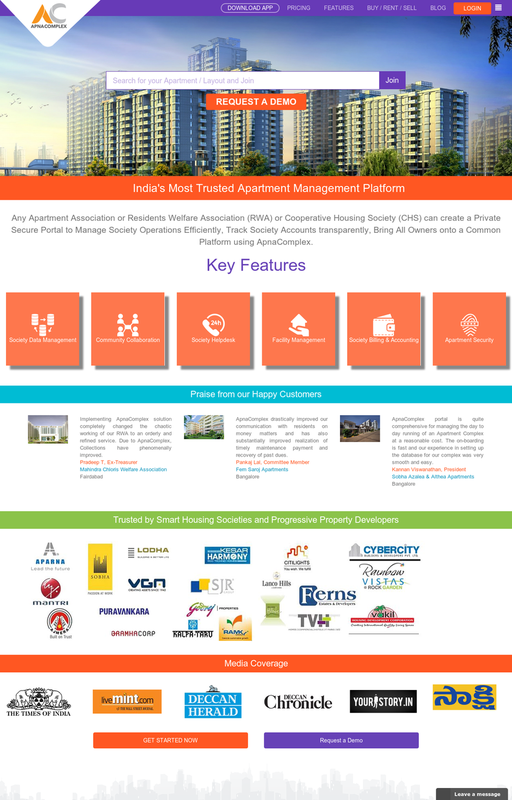 Having used other Apartment Management software I can vouch that ApnaComplex is India’s No 1 Apartment management Software. The accounting module does not permit the Accountant to manipulate the accounts without the appropriate permissions being given. Details of every individual making an entry is logged. The ease of use and automation of the system cuts the accounting costs by 50%. The various reports that can be generated with the click of a mouse has been appreciated by the not so tech savy members. Members can check their payments online without having to contact the RWA office. Other than Accounting, every other feature that you can conceivably think of for communication, facilities management and other aspects of society management, have already been incorporated in ApnaComplex. I stand by every word the company has stated in their “Details of Features and Benefits” pages. Last but not the least, their exemplary support makes life so much easier. Thank you Major Ramesh! We are happy we are able to help your society! ApnaComplex is always in the verge of offering and developing smarter ways to address the growing issues in handling the apartment complex operations, through its apartment management software. Our team got an adrenalin rush and a sense of satisfaction when we received a ‘Big Thank You’ from one of our premium customers – Suncity Apartments (a 1200+ flat landmark and mega complex in Bangalore) this Independence Day. Suncity Apartments have started using ApnaComplex from Aug 15th 2013. Suncity has selected ApnaComplex after thoroughly evaluating several solutions in the market (the evaluation itself was one of the most comprehensive we have experienced). Exactly one year later they sent us the below note of appreciation along with a certificate. The note very neatly sums up how ApnaComplex was able to help them in various aspects of apartment management and how we made a difference. Its a proud moment for all of us at ApnaComplex to receive this note and certificate – there is surely no award that is bigger than a award from a customer. 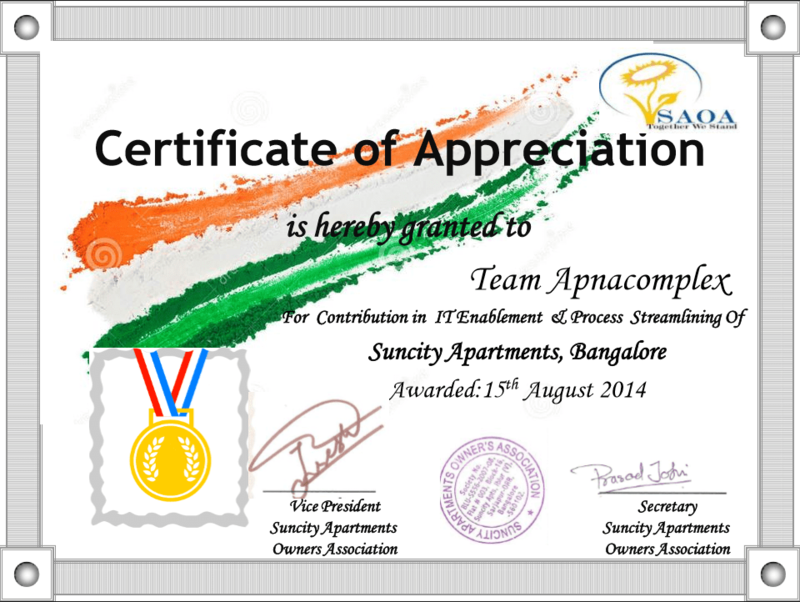 Suncity Apartment Owners Association (SAOA) wishes a very happy Independence Day to entire Apnacomplex team. Got rid of thousands of Excel and Tally. Complete finance is driven by ApnaComplex. Tracking of staff attendance using bio metric module. Specifically, we would like to mention flexibility that Apnacomplex has shown when it came towards a specific requirement of Suncity or enhancement or support. We consider Apnacomplex as our IT partner and looking forward for many more years of fruitful association. As we mature, we would like ApnaComplex to consider and implement some new scenarios where we can act as SME to take this partnership to a new high. A big “Thank You” to the entire team. Want to implement ApnaComplex.com in your Apartments and reap the benefits like Suncity, just Get Started in less than a minute.